Luke 24:44-53 Then he said to them, “These are my words that I spoke to you while I was still with you—that everything written about me in the law of Moses, the prophets, and the psalms must be fulfilled.” 45 Then he opened their minds to understand the scriptures, 46 and he said to them, “Thus it is written, that the Messiah is to suffer and to rise from the dead on the third day, 47 and that repentance and forgiveness of sins is to be proclaimed in his name to all nations, beginning from Jerusalem. 48 You are witnesses of these things. 49 And see, I am sending upon you what my Father promised; so stay here in the city until you have been clothed with power from on high.” 50 Then he led them out as far as Bethany, and, lifting up his hands, he blessed them. 51 While he was blessing them, he withdrew from them and was carried up into heaven. 52 And they worshiped him, and returned to Jerusalem with great joy; 53 and they were continually in the temple blessing God. Over the last week, from Monday evening to Friday morning, I attended a national preaching festival here in town. Nearly 2,000 preachers and church people from all over the country showed up to worship together and to hear other preachers preach and then talk about preaching. The preachers covered the palette of skin color, gender, and denomination. It was inspiring, humbling, and hilarious. On Tuesday evening, I came home from the conference all pumped up after having heard long time Old Testament scholar Walter Brueggemann preach. In the time it takes you and I to celebrate another birthday he’s published another couple of books. He’s up to about 90 of them. If you’ve not heard his name, you’ve certainly heard his ideas preached. Anyway, he was to lecture to us the next morning and I COULD NOT WAIT! I went in to say goodnight to my daughter and told her all of this juicy news about Walter Brueggemann and told her I was fan. Then, I’m ashamed to admit, I did a very uncool thing. You can consider this my public confession. 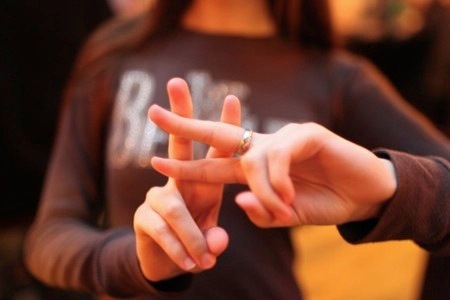 I made a number sign with my fingers and said, “Hash-tag fan-girl” and made a double clicking sound. She smiled and shook her head oh so tolerantly at me and said, “Oh, mom.” On the way to take my daughter to school the next morning, I’m STILL talking about Walter Brueggemann. She told me that the conference was funny. I asked her why it was funny. She said it’s funny how much I liked it so much and that it was like a music festival for preachers. I know, you don’t have to say it – I know how to take a few days and really have some fun! A few of you turned up at the festival to hear some preaching too. One of the amazing things to me is how many non-preacher church types attend. I mean, for me it makes sense to hang out from time-to-time with other pulpit people. It’s amazing that it make sense to people simply to come, worship and listen to sermons on their days off. That’s a pretty powerful God we worship. Two of our readings this morning come from the Gospel of Luke and the Book of Acts. Both of these books are attributed to Luke. The verses we hear today are from the same author and come from the very end of Luke and the very beginning of Acts. Luke and Acts are so closely tied together that they take on hyphen, becoming Luke-Acts. Kind of like hyphenating two names into a married name…Luke-Acts. The books are so wedded together in my own mind that I’m occasionally surprised to find the Gospel of John between them when I’m looking for Acts. Both books are written to Theophilus. Theophilus means ‘friend of God’ in the Greek. There’s a difference of opinion about whether Theophilus is an actual someone that Luke knows or if it’s used as a generic greeting to anyone who is a friend of God. After last week’s story when Jesus blew our minds by calling us friends, I invite us to hear the gospel writer talking to each of one of us as friend of God. Christians throughout the ages flip Jesus’ message of repentance and forgiveness into the message that Jesus is going to come back with a big chip on his shoulder and you should be very afraid. It starts with these misguided disciples in Luke-Acts and then with Paul in his letter to the Ephesians read for us today and it keeps right on going to now. Is it possible that the human disappointment about Jesus’ actual ministry of forgiveness gets projected into a second coming worthy of the next blockbuster revenge film? Notice that Jesus does NOT tell his disciples to run around and figure out who is responsible for his execution on a cross so that when the time is right, all heaven is going to break loose. We can thank wild interpretations of the Book of Daniel and the Book of Revelation for this line of thought. We can thank our own human taste for revenge too. I was on the phone with my mother the other day. She had muted the news when I called and had been listening to the verdict coverage of Mr. Tsarnaev, the Boston Marathon bomber. As we spoke, she suddenly broke in with, “He’s been given the death penalty…He’s been given the death penalty…it’s in big, flashing, red letters on the screen!” And then we were quiet. My friends, there’s a fine line between justice, consequence, and the sweet taste of revenge. We crave it like the disciples and end up on the razor’s edge – teetering precariously between righteous anger and unholy retribution. Let’s be aware of that razor’s edge as we talk about what’s going on for Boston, the bombing victims, and Mr. Tsarnaev. Here’s something to consider. The uber-angry God riding in on the clouds that gets depicted in artwork, novels, and films does NOT line up with Jesus’ words and ministry. Again, Jesus is talking about repentance, forgiveness, and witnessing. It’s what he began talking about with John the Baptist, what he died talking about, and what he ascended talking about. How are we not getting this?!! “…the same way…” Hmmm…. Could the “same way” mean not on a cloud but rather mean publically and visibly? Perhaps like the public and visible Holy Spirit swooping in with the sound of rushing wind and the likes of fire. Second coming and rapture theology is so pervasive in the culture-speak of apocalypse that it’s easy to miss Jesus’ words and miss Jesus altogether. Is it really so much easier to think that Jesus is coming again on a cloud rather than that Jesus sent the Holy Spirit just a week later, publically and visibly kicking off the ministry of the church to witness to the power of forgiveness?! Friends of God, beautiful and flawed Theophili, this IS good news indeed! Alleluia and amen. Ephesians 1:16-23 I have heard of your faith in the Lord Jesus and your love toward all the saints, and for this reason 16 I do not cease to give thanks for you as I remember you in my prayers. 17 I pray that the God of our Lord Jesus Christ, the Father of glory, may give you a spirit of wisdom and revelation as you come to know him, 18 so that, with the eyes of your heart enlightened, you may know what is the hope to which he has called you, what are the riches of his glorious inheritance among the saints, 19 and what is the immeasurable greatness of his power for us who believe, according to the working of his great power. 20 God put this power to work in Christ when he raised him from the dead and seated him at his right hand in the heavenly places, 21 far above all rule and authority and power and dominion, and above every name that is named, not only in this age but also in the age to come. 22 And he has put all things under his feet and has made him the head over all things for the church, 23 which is his body, the fullness of him who fills all in all.